Home > Useful WhatsApp Tips > How to Fix WhatsApp Restore Failed Issue on Android? “WhatsApp Chats Unable to Restore from This Backup”? “I have been running into a problem of restoring WhatsApp messages on my new Pixel. When I downloaded WhatsApp on my new phone and tried to restore WhatsApp from Google Drive, it stuck at 43% and then shown me the restore failed notification”, said Emma, avid user of WhatsApp. It’s surely that lots of WhatsApp messages have sentimental value to us. If you face the same issue like Emma, what can you do to solve this WhatsApp restore failed problem? How to Fix WhatsApp Google Drive Restore Failed Problem? If you fail to restore WhatsApp chat history from Google Drive on Android phone, or to say the restoration process is stuck, there are several methods that you can apply to fix the problem. Many cases prove that WhatsApp restore failed issue can be fixed automatically by updating the WhatsApp Messenger app. Please make sure that you are using the newest version of WhatsApp. If not, you’d better get the latest version from the WhatsApp official website instead of using the Google Play Store to upgrade. Check whether you have connected to the Google account that is used to backup the WhatsApp before. And most importantly, make sure you have enough space in your phone storage that you use to restore your WhatsApp chats. If your phone runs out of space, you have to delete some contents to make room. By the way, don’t worry about deleting important data by mistake, because you still have chance to recover the deleted data from Android phone memory. 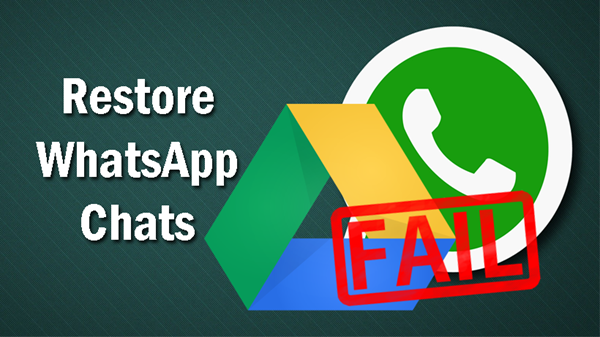 When Google Drive WhatsApp backup restore fails, it may be that something is corrupt with the backup file. 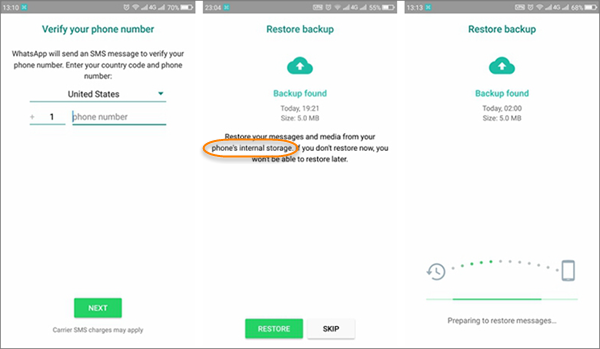 However, if you have a local WhatsApp backup file on your phone, you can make use of this backup, usually named “msgstore.db.crypt12”. Firstly, copy this backup file to another folder in your phone or computer, and then uninstall WhatsApp completely. Then install WhatsApp on your phone again, and copy that backup file to WhatsApp > Databases folder. Please note that you have to disable the mobile data and the Wi-Fi connection before WhatsApp asks you if you want to restore the data. So that the app will restore WhatsApp from the local backup instead of the online one which is corrupt. 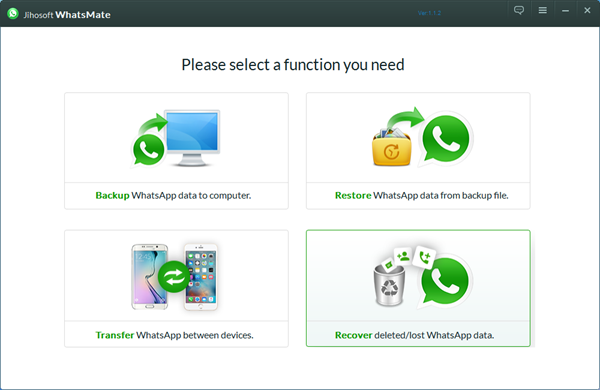 If you want to restore WhatsApp to a new Android phone, while the restoration process is stuck, you can also use the above way to restore the local WhatsApp backup. To do that, you just simply copy the backup file from your old Android to the new Android. Tip: WhatsApp backup files are stored in internal storage/WhatsApp/Databases. If your data is stored in the SD card, you may find the backup file in sdcard/WhatsApp/Databases. How to Restore Deleted WhatsApp Messages on Android without Backup? What if you fail to restore WhatsApp from Google Drive, and you don’t have local backup too? Rest assured. Here is another alternative to restore deleted WhatsApp messages on Android even if you don’t have any backup. To do that, you need help from this WhatsApp Manager, which is able to recover deleted WhatsApp chats, photos, voice messages and contacts from Android phone directly. Tip: The safest way to protect your WhatsApp data is to back it up to your computer. This tool lets you backup WhatsApp to computer freely, and then restore it back to Android or iPhone device whenever you want. You can refer to this tutorial and learn more about how to recover, transfer, backup and restore WhatsApp data on Android with this powerful WhatsApp Manager.